What's traveling without partaking on local delicacy? Thankfully I have no food allergies and with how I take food - one would think I had four stomachs. Anyone who travels on a budget knows that we only eat at fast-food places - this is entirely incorrect. You can actually save so much more money if you opt for local dishes. Most meals costs less than Php80 at most! I was never a picky eater and I have an adventurous tongue that encourages me to try something new. During my travel in Ilocos, I have listed a few food items that stuck to me the most and those that you should try when you come by to visit. Let's get the rice cookin'. Poqui-Poqui is a very simple vegetarian dish made from grilled eggplants mixed in with sauteed onions, garlic and tomatoes. Slightly soupy yet very light it's a perfect pair if you order bagnet. The name is a bit cheeky but it originates from the Hawaiian word "poki" which means "mash or slice". Don't be fooled with how it looks, trust me the taste lingers on. Bagnet is Ilocos' version of crispy pork belly. Yes, it is similar to our favorite lechon kawali. Preparation to achieve this crispiness was to have the meat boiled first then deep-fried. Crispy and usually served with pickled veggies or slices of tomatoes, onions and drenched in Ilocos vinegar. 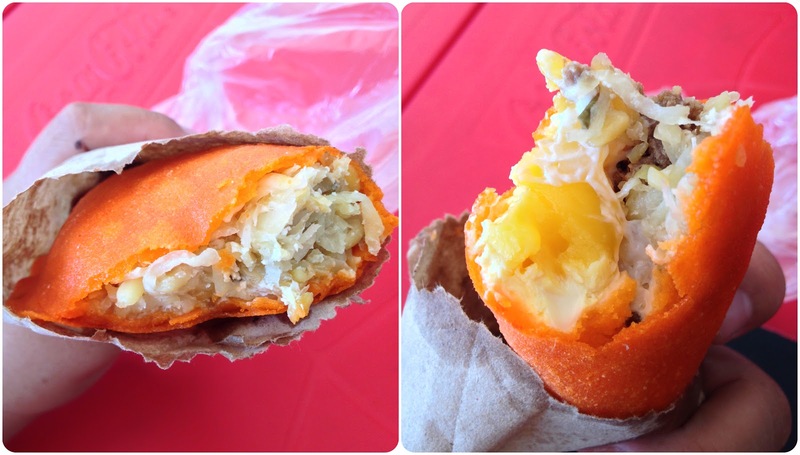 Batac Empanada is known for its striking orange color. The color comes from the use of annatto seeds. This small bundle of joy is filled with longganisa and green papaya and eggs. Deep-fried to crispy goodness and served warm. Best paired with a cold glass of soda or beer. Whatever floats your boat. You may need another serving - one is never enough. Are there specific Laoag food items I missed? Share it in the comments.